To Register for all Sewing Classes...Register in Person or Call 479-636-8240. 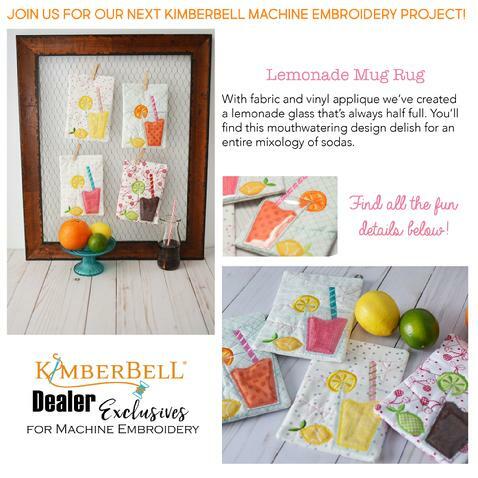 "Lemonade Mug Rug". Fee $20. Freearm Embroidery on your BERNINA Embroidery Model... BERNINA Creative Studio Embroidery Project. Learn to use the BERNINA embroidery's freearm, which provides you with more space when embroidering projects that are not flat. It makes it easier to create great looking embroidery even on a project with "shape" and can be used with several BERNINA hoop sizes. You will embroider a onesie for practice. Tuesday April 23 at 9:30am. Freemotion Quilting Placemat Class... BERNINA Creative Studio Project. Learn the basics of freemotion quilting, how to get started, as well as a few practice tips and tricks. Learn beginning free motion skills practicing simple wavy lines. Turn those wavy lines into basic fillers such as meandering, pebbles, and swirly pailseys. Create with any BERNINA machine. Tuesday April 30 at 9:30am. Come and use your embroidery machine to embroider a fun towel each month. You will embroider your towel in class and go how with a finished project. Class open to anyone...Not just embroidery/software owners. Back by Popular Demand. Create this fun project bag...also great for small rulers! Also, learn tips and tricks for working with clear vinyl. Create with any BERNINA machine. Tuesday May 14 at 9:30am. Back by popular demand. Learn all the basics of applique by machine. Experiment with different stitiches and make this fun pillow. Create with any BERNINA machine. Friday May 17 at 9:30am. Faux-Sashed T-Shirt Quilt Class... BERNINA Creative Studio Project. 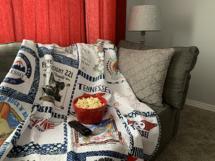 This faux-sashed t-shirt throw will go together in dash! With t-shirts and some pre-cut strips, you'll create what is sure to be your favorite throw. T-shirt quilits make great gifts and mememtos, and with this method, you'll want to make more than one. Create with any BERNINA machine. Tuesday May 28 at 9:30am. 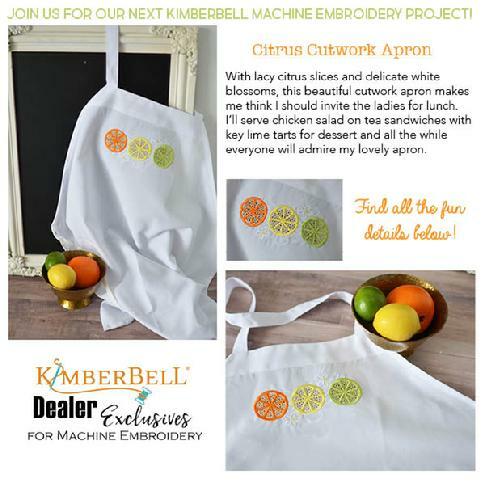 "Citrus Cutwork Apron ". Fee $20. Join Denise and make your own Rug out of a Jelly Roll/Pinwheel... We have many great ones to choose from. They are trendy and fun and you will love making one for yourself or a gift. Class meets 2 Times. Non embroidery project. Supply list with registraion. Class Fee $20. Call 479-636-8240 and let us know you are interested in a future session. Supply list with registraion. Class Fee $20. Skill level: Beginner. Call 479 636-8240 to let us know you are interested in a future session. In this 2nd Class, you will use what you learned in the basic ruler class to have fun working on an Amanda Murphy panel. Supply list with registraion. Prerequisite: Basic Ruler Class. Class Fee $20. Skill level: Beginner. In this 3rd Class, you will use what you learned in the basic ruler class and the panel #1 class to have more fun working on your Amanda Murphy panel. More Fun Techniques! Supply list with registraion. Class Fee $20. Prerequisites: Beginnger Ruler Class and Beginner Ruler Panel Class. Skill level: Beginner. REGISTER for ALL Classes! If weather is bad, please call to verify that your class is still meeting. We will normally reschedule the class. Please note that Children are not permitted in classes or clubs. Also, non service animals are not permitted. Please turn off cell phones during class. We will gladly credit any class fee if you cancel 48 Hours prior to your class. Thank you for helping to create a great learning environment! 1802 South 8th Street (71B) Rogers, AR 72756 Phone (479)636-8240. Mailing address: P.O. Box 280 Rogers, AR 72757 Fax (479)636-1703. Monday to Friday 9-5. Saturday 9-4.